The Carnival on Madeira Island is said to be known as one of the best in Europe. Each year, Carnival festivities start forty days before Easter. Hence, It is the year’s first major festival after the Christmas and New Year’s extravaganza. Therefore in 2019, the actual Carnival dates are from February 26th to March 6th. For 2020, please check out this post. 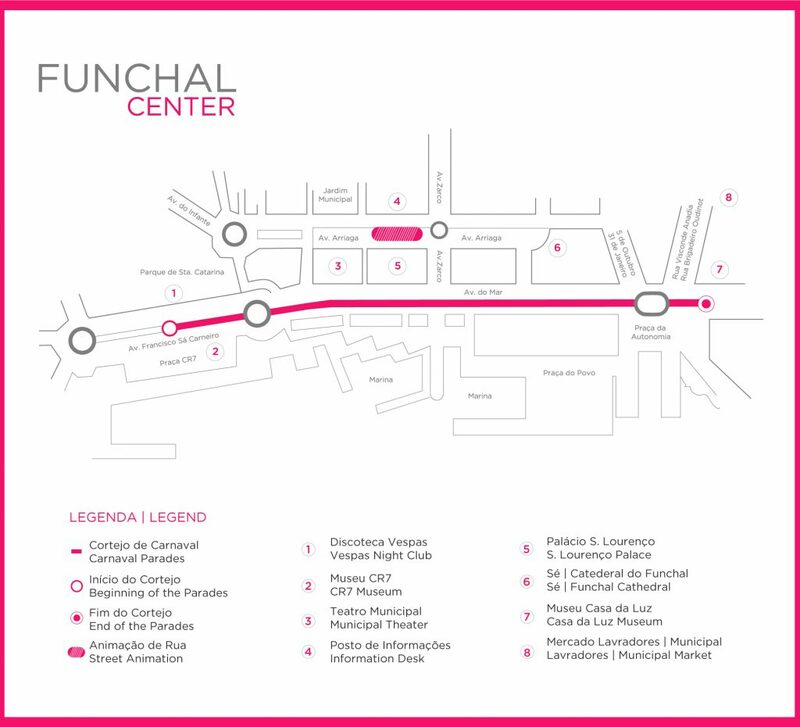 During that period the city of Funchal is decorated with festive colors and lights. 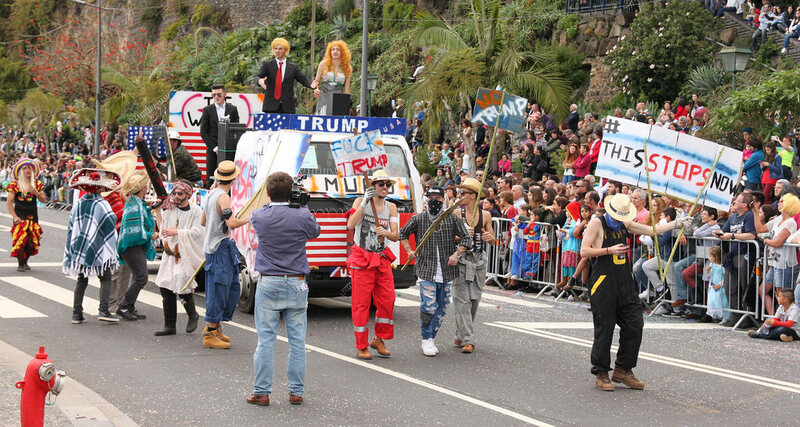 There are two main Carnival Parades in the streets of Funchal. 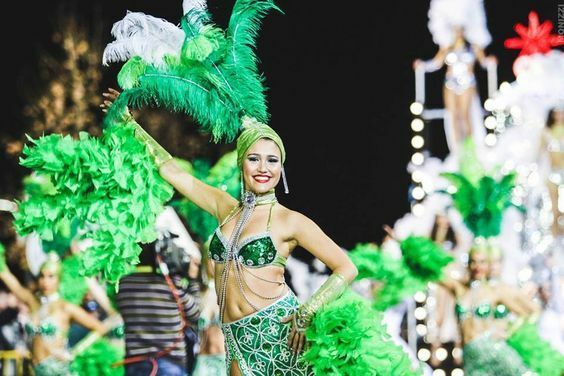 The first one is the Allegorical Parade featuring thousands of participants in beautiful, colorful and elaborate costumes dancing to the captivating samba music. This famous parade takes place on Saturday. Numerous Samba or dance groups rehearse all year to parade, dance and heat the atmosphere in their beautiful costumes. This carnival undoubtedly evokes the world-famous Rio Carnival in Brazil with its costumes and enthusiasming rhythms. You cannot help but move to the contagious music yourself as the parade evolves in front of you. Dozens of carefully and beautifully decorated floats alternate with dancing and music groups. This is the route taken by the Carnival Parade. After the traditional parade, all concentrate of the Praça do Municipio in a magical atmosphere. 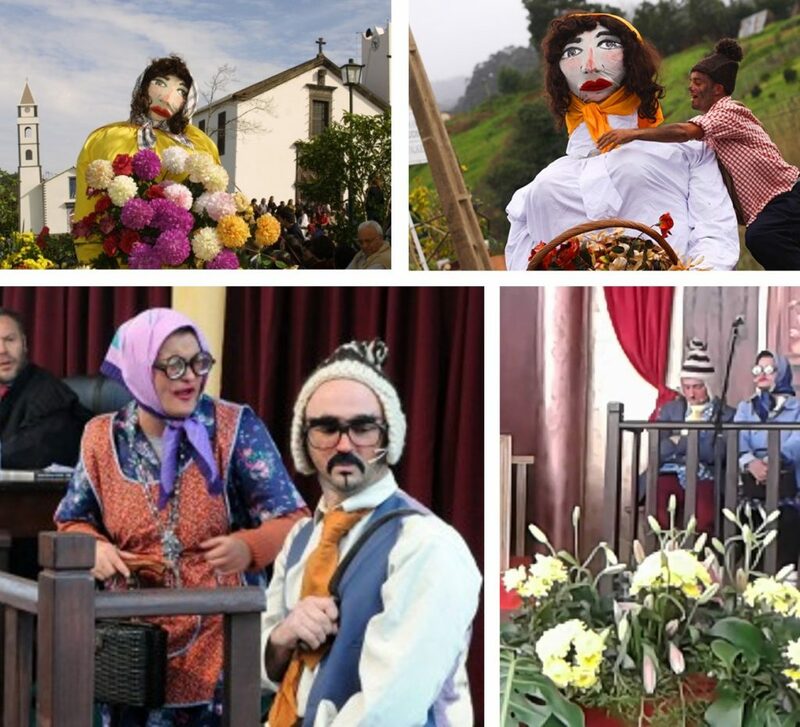 The second one – Trapalhão Parade (or slapstick parade) – features participants dressed as caricatures of local and international politicians, and social happenings of the year past. Guests and locals are welcome to participate in this parade. This one traditionally takes place on Carnival Tuesday. During both events, you can try local delicacies such as bolo de caco or poncha served on each street corner. The Compadres Feast (Festa dos Compadres) actually opens the Carnival Season. It takes place in Santana (North Coast of Madeira). This Feast signifies the passage from Winter to Spring. Actors perform comic sketches highlighting recent social and political events. Giant figures parade through the city before being publicly ridicules, judged and then burned. A Children’s carnival takes place on Friday before the Allegorical Parade. Hence, this allows school children to parade with their home or school made masks and attire through the streets of Funchal.